Artisan cast metal range hood shell with a custom enamel color body and stainless steel strapping and decorative rivets. This is just one of the many color choices for artisan cast range hood shells. Shaker-style range hood shells in artisan cast metal. This close-up illustrates the coverage of the metal finish and how it's applied to corners and design details. 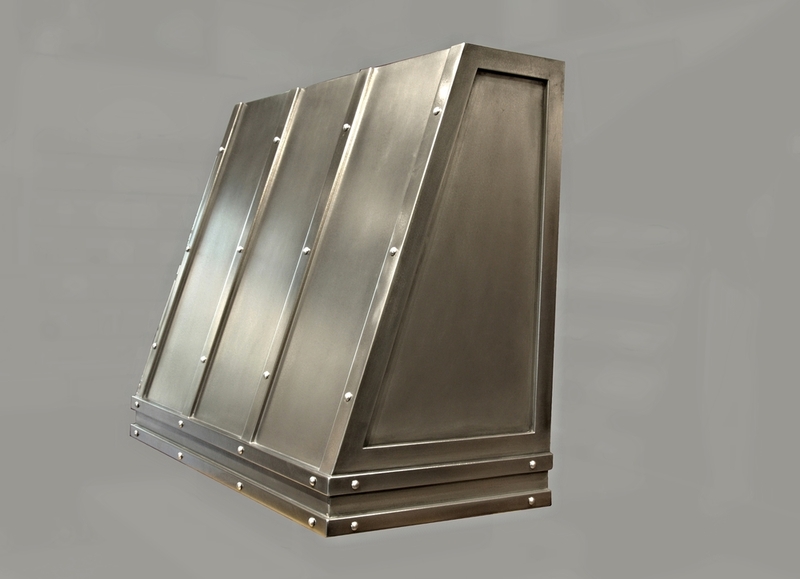 Artisan cast metal range hood shell with a custom gray enamel body and brushed stainless steel strapping and trim. Slant-front style metal range hood shell with a custom blue enamel body and artisan cast stainless steel strapping and trim details. The trim also has decorative nail heads for a modern industrial aesthetic. 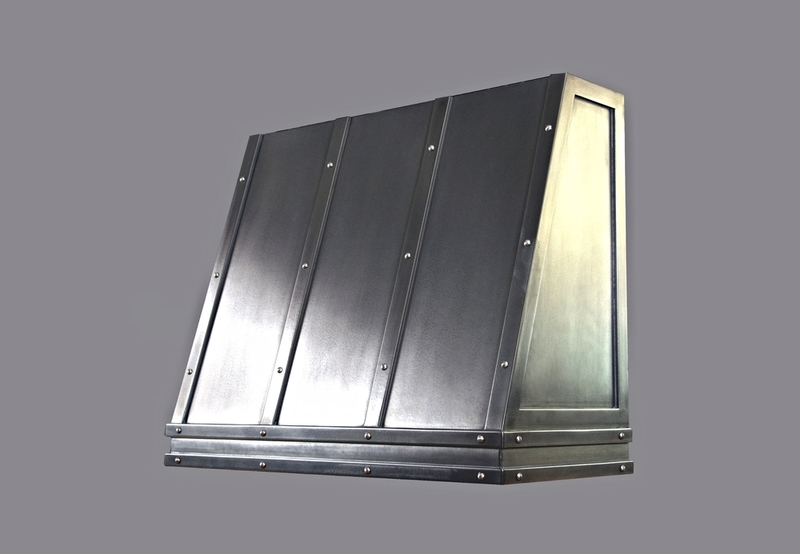 The dramatic finish on this artisan cast range hood shell is great for a rustic kitchen. The level of shading and patina on the metal range hood can be customized to fit the aesthetic needs of your kitchen and home. The underside of an artisan cast metal range hood shell shows how you can add your choice of inserts to get the power and ventilation necessary for your kitchen hood. We can apply patina and shading to our artisan cast metal products and range hood shell to fit your style. This artisan cast metal range hood shell has an intense and dramatic shadow that creates a rustic and aged look for this classic slant front kitchen hood style. Slant front artisan cast metal range hood shell with light shadow and patina to create a well-worn look. The stainless steel strapping and trim give a bit of contrast and depth to the range hood's design. 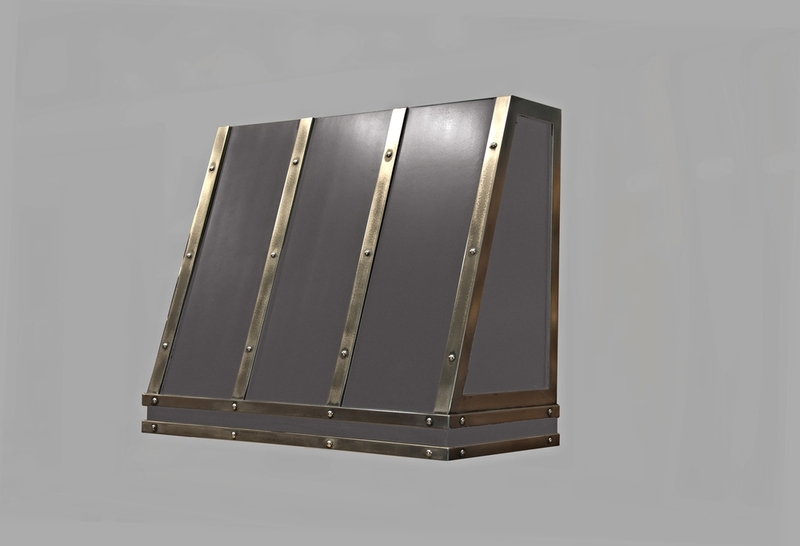 Gray artisan cast metal range hood shell with brass strapping on the top and bottom and matching brass rivets. 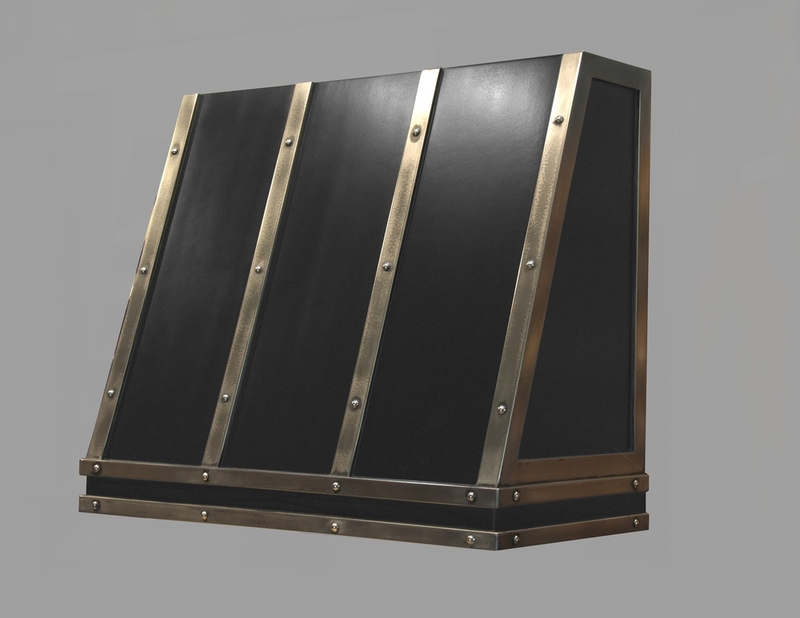 Artisan cast metal copper range hood shell with high polish brass strapping and matching brass rivets. Gray enamel artisan cast metal range hood shells with polished brass trim and matching decorative rivets. Artisan cast metal range hood shell with a blue enamel body and polished copper trim and matching copper rivets. Modern zinc slant front artisan cast metal range hood shell with matching strapping, trim, and decorative rivet details. Slant front artisan cast metal range hood shell in brushed nickel. The nickel on both the hood body and strapping details creates a modern but subtle look that would fit in well in a classic white kitchen. Artisan cast stainless steel range hood shell with a matte brushed finish and matching straps and trim to add dimension to the slant front style. 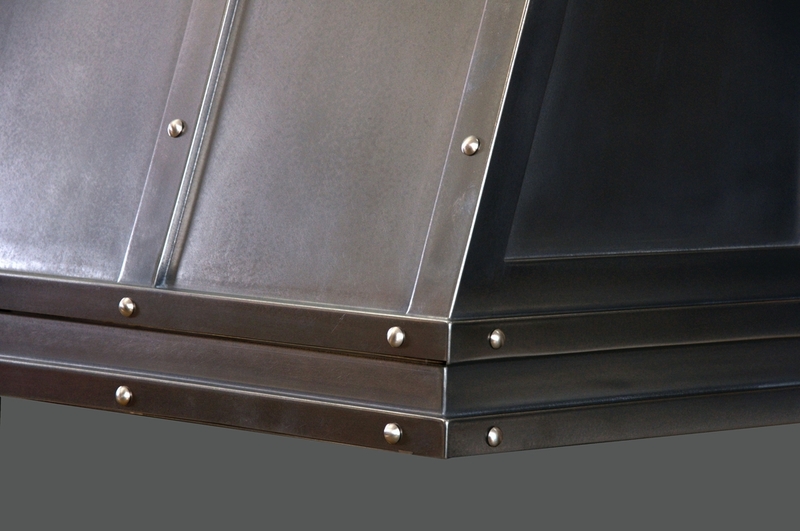 A close-up photo of the metal edge detail on a stainless steel artisan cast range hood shell. This shows the full coverage of the artisan cast process and how it works on this shaker style hood. 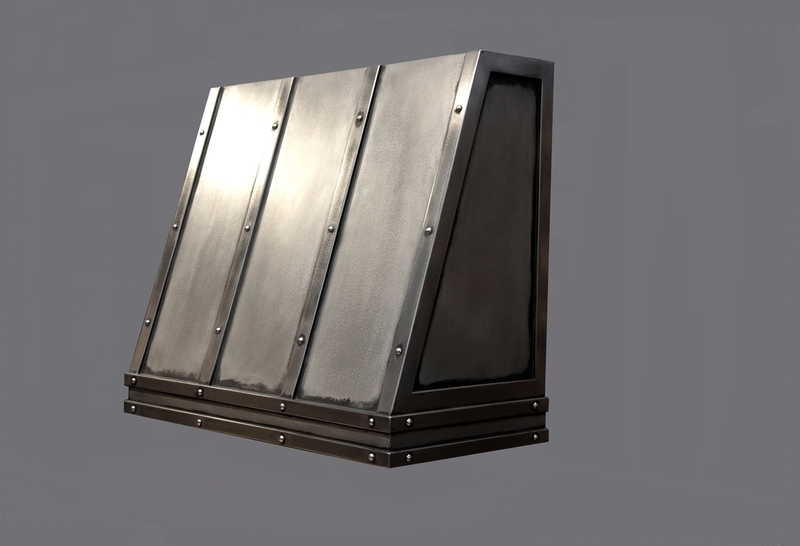 Stainless steel artisan cast metal range hood shell with decorative rivet details. Black enamel and stainless steel artisan cast metal range hood shell with decorative rivet details on the straps and trim. 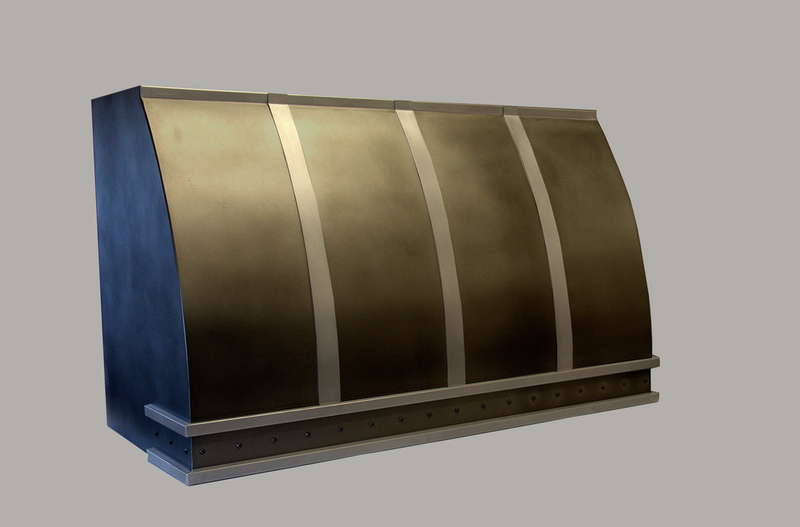 Artisan cast metal range hood shell with a matte stainless steel body and strap details. This hood also has matching decorative stainless steel rivets. Matte zinc artisan cast metal range hood shell with matching strapping, trim, and nail head rivet details. Pewter artisan cast metal range hood shell with light patina. This curved front style is a popular shape for metal range hoods. The light patina gives it a contrast to the matte pewter strapping and trim details. The dark patina on this pewter artisan cast metal range hood shell gives this curved hood a contrasting and modern look against the matte pewter straps and trim details. 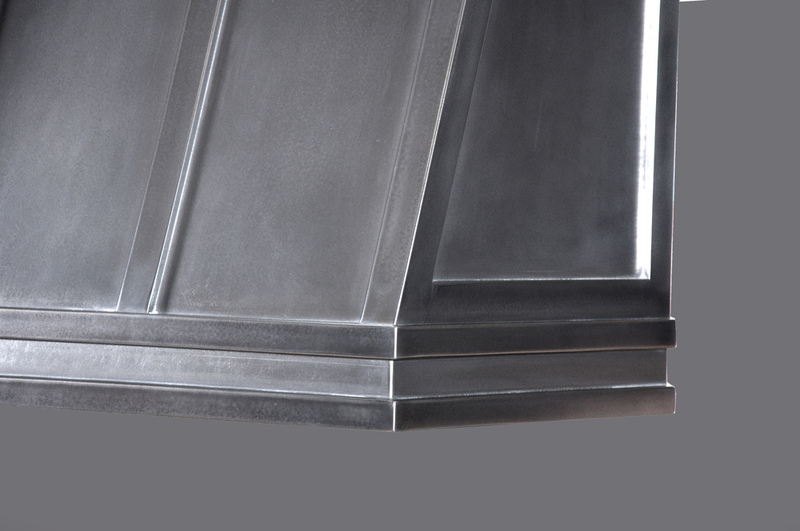 Matte pewter artisan cast metal range hood shell with matching straps and trim details. 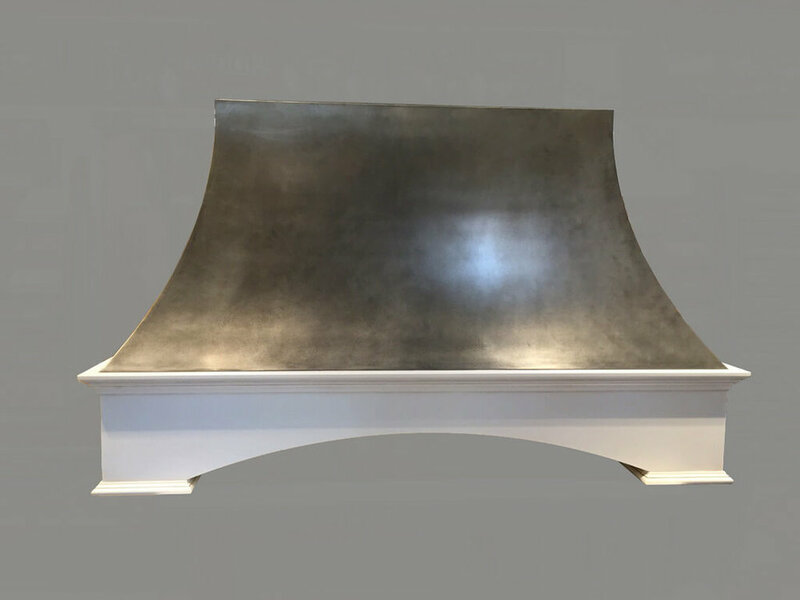 Artisan Cast Nickel coating on a concave shape range hood. Range hood shell provided by customer, and coated with Brooks Custom's artisan cast metal. Closeup on the artisan cast nickel coating on a concave shape range hood. The range hood shell was provided by our client, and coated in Brooks Custom's artisan cast metal. How are Artisan Cast Hood Shells Made? Artisan cast hood shells are made using the same metal coating process as our Bistro Collection countertops, bar tops, and furniture. We apply the metal coating to a stable subframe, which is engineered to fit the hood insert of your choice. Artisan Cast Range Hoods are Available in eight metals; zinc, pewter, copper, bronze, brass, nickel, aluminum, and stainless steel. A wide variety of finish options, custom enamel colors, and metal detail design options are available to help you create the hood style you've always wanted at an affordable price point. Any commercially available insert may be incorporated with your hood shell.